According to an internet posting from family friend Clifford Meth, the comic book artist Dave Cockrum, whose work on the Uncanny X-Men title laid the foundation for that property's pop culture icon status, passed away this morning from complications due to diabetes following a few years of serious and at times grave illness. Cockrum was born in Oregon; his father was in the United States Air Force and the family frequently moved as a result. Like many children with parents in the military, Cockrum began reading comics at an early age. Cockrum was a well-known artist in the potent fanzine circles that developed in the 1960s and early 1970s. His many contributions included work for Star-Studded Comics and Fantastic Fanzine. It looks as if Cockrum pursued his art even while serving in the Navy for six years following graduation. Howard Groth, the father of the publisher Gary Groth (who was then an active force in fan publishing circles), related an anecdote for the forthcoming We Told You So: Comics As Art that indicated Cockrum wore two hats. Somehow through the mail, [Gary] ran into a guy named Dave Cockrum. Dave Cockrum was an artist. Gary used a Dave Cockrum drawing as a cover for one of his publications. Dave Cockrum was a sailor in the Navy, stationed out in Guam on a Polaris submarine tender. I was working for the Polaris program. I went to Guam and handed the issue to Dave Cockrum aboard that ship. He was quite thrilled with that. No one else was getting hand-delivered Fantastic Fanzines. After leaving the military, Cockrum worked for Warren Publishing and as an inker to DC Comics artist Murphy Anderson. He received his first series assignment on the "Legion of Superheroes" feature, but eventually left DC for work at Marvel after a dispute about original art (he would later return). 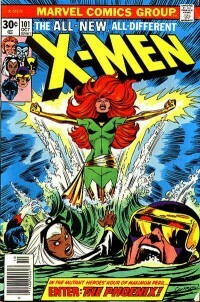 In 1975, Dave Cockrum and Len Wein co-created the new team of X-Men, Marvel's mutant superheroes in the comic book of the same name. At that point in time, the X-Men were perhaps the least popular of Marvel's initial burst of Stan Lee-Jack Kirby collaborations. Before Wein, Cockrum and Editor Roy Thomas initiated their revival, the title was a reprint comic book running old X-Men stories rather than brand new ones, about as low as a comic book could sink in the mid-'70s. For some of the new X-Men characters, Cockrum used designs that had been in his notebook and likely intended for the Legion assignment before his departure. Cockrum provided cover and interior art for Giant-Size X-Men #1, then again for X-Men #s 94-105 and #107. Although the feature did not achieve top-of-company success until well after Cockrum left, the artist's designs, building on an approach first seen on the Legion title, were as appealing as any group of characters ever created for the company. The X-Men co-creations in particular are some of the few from that period that can be said to hold their visual own with the Marvel designs of Jack Kirby and John Romita. It's easy to underestimate Cockrum's penciled art in the book itself. Cockrum's penciled interiors on those first few issues of the "new" X-Men were dark and appealingly dramatic; in keeping with the book's more serious themes, the evocation of superpowers in the stories was often depicted as dirty and painful, and his characters were for the most part weathered adults instead of smooth-faced children -- in a time near the end of the Cold War when that distinction mattered. Cockrum gave those first few issues of X-Men a sumptuous, late-'70s cinema style that separated the book from the rest of Marvel's line, and superhero comics in general. Reading those X-Men comics felt like sneaking into a movie starring Sean Connery or Sigourney Weaver, not simply like flipping on the television. Uncanny X-Men really felt new and different, almost right away, and Cockrum's art was a tremendous part of that. Cockrum's figure drawing proved just as memorable and I think significant as his design work. Cockrum favored handsome men and women. He drew one spooky and vastly underrated Wolverine (Cockrum drew the reveal that the claws were in the character's armsm not his gloves). His Nightcrawler -- one of his co-creations in the group, along with Storm and Colossus -- held shadow and color in such an appealing way it became the artist's signature character. Cockrum returned for a brief but solid run on Uncanny X-Men following the famed Chris Claremont/John Byrne partnership on the title, and would create the original graphic novel and series The Futurians, first at Marvel and then, briefly, with a company called Lodestone. An attempt to push that project into movies and other areas of the entertainment business occupied the artist in recent years. In 2004, Cockrum became seriously ill and was the beneficiary of aid from a number of fellow writers and artists including the aforementioned Clifford Meth and the artist Neal Adams. An auction on his behalf raised $25,000, and Marvel began to pay the artist for his work in co-creating the successful X-Men franchise, an arrangement that one hopes might be repeated in future years with different artists. Dave Cockrum is survived by a wife, Paty, as well as an ex-wife, a son and two stepchildren. He was 63 years old.